Some time your downloading something and you need to leave your computer on but after some time you want to turn off system but your are not available to do it manually.So you need system schedule software to automatically shut down your system after some time to save some electricity bill. If you are in this situation you need sleep Timer it can Automatically shutdown, Restart and Hibernate your computer after defined time. 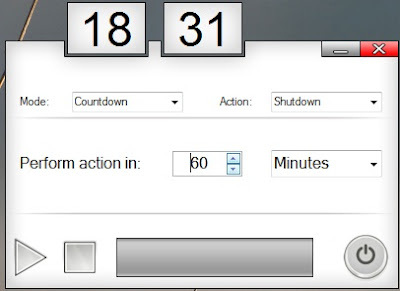 Sleep timer is free software and can work in Windows Xp/Vista and windows 7 it is simplest software need not require any installation. It is a portable software that mean you can run this from your USB flashdrive. There is three options one you can shutdown computer restart your computer or you can hibernate your computer automatically. After completing download run the software and select mode for action or put default mode as countdown. Countdown show you specify amount of time remain for action and second option is inactive mode as name it remain inactive and after specified time it just performs the action. where as third option is time mode in time mode you can specify the time to perform the action. Now select action you can select Shutdown for shutdown,restart and Hibernate. and specify time to perform action and press Play button to start timer. In during if you want to stop your scheduled action press stop button or power/shutdown button to turn off the software.